The true enthusiast wants the best of everything. Nowhere is this notion better illustrated than in the PC space. How many of you have played around with online configurators and 'built' a dream machine? There will always be conjecture on whose memory or graphics card you should use for the ultimate desktop platform. Arguably what's beyond discussion is the brand of CPU. AMD will admit privately that rival Intel has the high-end space sewn-up, particularly with the many-core Extreme chips that are Xeons in a different guise. It's been almost a year since Intel debuted the $999 Core i7-4960X - a six-core, 12-thread monster hewn from third-generation Ivy Bridge technology. Yet the next generation of silicon, codenamed Haswell, has been doing the mainstream rounds since June 2013, with Intel mixing and matching architectures as it sees fit. Now, however, Intel is (briefly) aligning the desktop processor stack by launching high-end chips based on the same Haswell technology. Known as the Core i7-5000 series and propelling performance further by using up to eight cores and 16 threads for the first time in a consumer chip, the new Haswell Extreme (HSW-E) is primed to set the heavily-threaded benchmarks alight... at a price. Intel is today bringing the Core i7-5960X, Core i7-5930K and Core i7-5820K to bear on the ultra-enthusiast segment of the market. The Haswell Core architecture is a known quantity, and has been for almost 18 months, so there are no surprises regarding the nuts and bolts that constitute the trio of HSW-E chips. We've lined the new processors against the trio of Ivy Bridge-powered processors they'll replace, as well a slew of other recent Intel Core processors that are familiar to most readers. Focussing on the range-topper first, the eight-core, 16-thread topology is worth repeating, because you won't have seen it in desktop form before. And unlike previous X-nomenclatured enthusiast processors, Intel hasn't yet released the Xeon version - the upcoming E5-2667 v3 is most similar in specifications - so HSW-E can be considered something of a trailblazer. The chip runs at a default 3.0GHz, rising to 3.5GHz under lighter loads. Note that the previous top-end processor, Core i7-4960X, operates at higher speeds, though it has fewer cores and threads to muster. The minor architectural improvement - Haswell vs. Ivy Bridge - allied to the greater number of cores/threads are a sure-fire indicator that Core i7-5960X is going to be faster than any previous consumer chip when run in heavily-threaded applications. 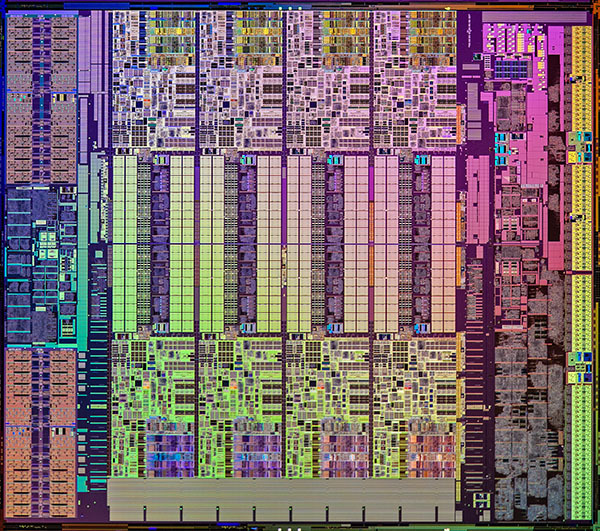 It's a big piece of silicon, too, coming in at 38 per cent larger than the Core i7-4960X. Built on the same fabrication process, the greater area is ascribed to the extra cores and enhanced cache - 20MB vs. 15MB - used to keep 16 threads gorged with data at all times. 40 PCIe Gen 3 lanes is the norm, enabling the processor to handle quad-card graphics, while the 140W TDP is standard for this type of chip. Shifting to a newer base architecture has enabled Intel to modernise the complete platform, beginning with a switch to DDR4 memory. Migrating to a new memory technology makes most sense at the high-end, where the additional cost is less of an issue. We're covering the finer details of DDR4 memory in the related chipset piece on the following page, so do head on over to take a peek at that. The pertinent information here is that entry-level DDR4 speeds of 2,133MHz and quad-channel memory architecture provide more bandwidth than ever before. More cores, more cache, a newer underlying architecture and, in particular, use of brand-new DDR4 memory means that Intel requires a new chipset. Known as X99 (LGA 2011-v3 socket) and incompatible with existing X79-based LGA 2011 boards for memory reasons above all else, entry into the Core i7-5960X club requires the additional purchase of a new motherboard and RAM. There's better value to be found on the two six-core, 12-thread models. 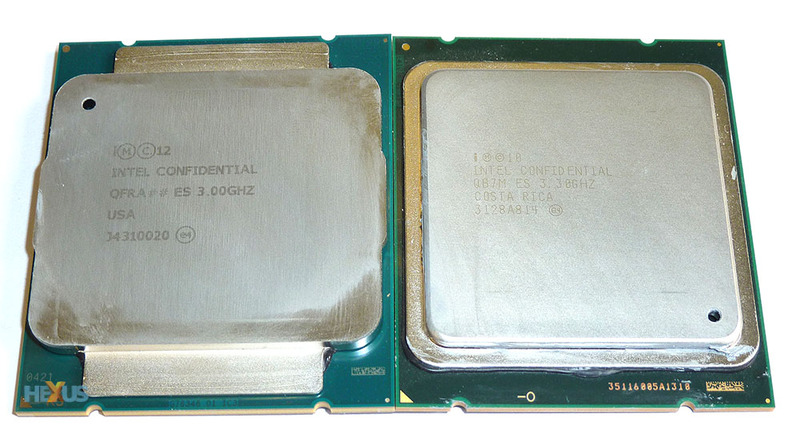 Fewer cores enables Intel to increase the frequency on both parts, but still not to the levels found on the previous-generation Core i7-4930K. The 5930K ($583) and 5820K ($389) are architecturally similar, imbued with 15MB of total cache and, in effect, do a fair approximation of the Core i7-4930K we've just alluded to. Intel usually castrates the cheapest model in some way. This time around, that's not happened as far as the cores/threads are concerned, which is a definite plus for budding enthusiasts on a relative budget, but does take the minor step of reducing the number of PCIe lanes from 40 to 28 on the Core i7-5820K. This is no great loss unless you're disturbed by losing the ability to run four-way SLI or CrossFire. Heck, the very fact that it's a K-class chip provides unfettered access to the multiplier. That, in other words, facilitates easy overclocking. Makes you wonder why the Core i7-5930K exists, because why pay a 50 per cent surcharge for a few extra PCIe lanes that most users won't miss? Perhaps one reason is Intel limiting the attractiveness of this cheaper part in the eyes of the workstation user, who often taps into multiple cards and therefore needs an abundance of PCIe lanes. This reasoning is tenuous at best. Making a case for the Core i7-5820K is easy. Intel is maybe wary of the performance overlap that existed between the best mainstream part (Core i7-4770K) and cheapest previous high-end processor (Core i7-4820K) for most of this year. There really is reason to opt for the latter when faced with the all-round abilities of the Haswell core, especially as it was introduced earlier. Now, however, with six hyperthreaded cores leading to 12 logical processors, Core i7-5820K should keep its nose ahead of the mainstream Haswell set. Intel knows this and, at launch, has priced it 25 per cent higher than the corresponding IVB-E, at $389. Of course, high-end chips are something of a backward step in terms of overall features; there's no integrated graphics, video transcoding assistance or, naturally, multi-monitor outputs. Users need to also invest in a discrete video card, pushing overall platform costs ever higher.